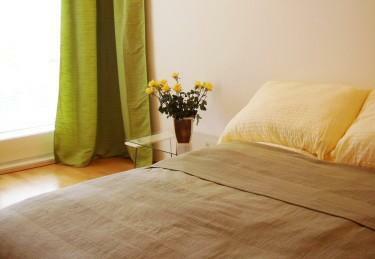 This modern studio is newly renovated, fully furnished and equipped to accommodate up to 4 people. It is easily accessible from the airport, railway station and a highway, and only minutes away from the city center. The studio is situated on the 6th floor with a lift. It is light, airy and quiet, thanks to the courtyard facing French windows. There is a double bed and a double sofa-bed. A baby cot is available upon request. Bed linen, pillows, blankets and towels are provided. Brand new kitchen is equipped with fridge, microwave oven, cooker, hood and dishwasher. Washing/drying machine is placed in the bathroom. New heating system includes floor heating in the bathroom. There is internet connection, TV, DVD-player. The studio is conveniently located in a quiet yet central area, only 1 minute from the Botanical Garden. A short walk through the Botanical Garden (free entry) takes you directly to the Belvedere Palace, a former residence of Prince Eugene of Savoy, and a home of the Austrian Art Gallery. Rennweg street will take you to the Schwarzenbergplatz and to the famous Ringstrasse.